"Personalised racer drink Bottle is a Stylish and durable bottle available at Vivid Promotions. The handy drink bottle is made from a stainless steel material and ensures long-lasting brand promotion. 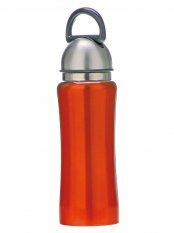 It features a sleek design with 600ml capacity and screw top. Get customized it with your brand name or logo for maximum impact. Some more features are: Size/Size Spec: 210Hx70D mm Decoration: 35Wx60H mm Colors: Black, Blue, Matt black (Rubber Coated), Red and Silver Features: Stainless Steel, 600ml capacity and Screw top Packaging info: 35 pcs/10 kg, 545x390x235 mm For more promotional product visit our website at www.vividpromotions.com.au"